Many classes of glass forming binary mixtures have been studied already to address important issues regarding dynamics in complex amorphous materials. The present project deals with binary systems formed by polymers blended with associating liquids, thus addressing a new level of complexity with respect to the previously investigated polymer/polymer, polymer/non-associating liquid, and non-associating liquid/non-associating liquid situations. Specific to associated liquids such as monohydroxy alcohols, water, peptide model systems, and also associating polymeric melts is the emergence of a strong Debye-like dielectric absorption at frequencies lower that those characterizing the ubiquitous structural rearrangements. A general agreement has been established recently that this slow process is related to the formation of supramolecular hydrogen-bonded polymer-like networks (computer simulations and scattering studies revealed that they local structures are predominantly twofold coordinated and therefore support this assignment), however the microscopic origin of the Debye-like dynamics still remains highly debated. So far such studies are lacking for the mixtures formed by systems which are able to sustain supra-segmental networks of different nature, e.g., covalent and transient ones. One should mention here that hydrogen bonding is the most common interaction involved in the formation of supramolecular polymers due to its intrinsic directionality, cooperative nature, and variability of cohesive strength The latter can be tuned, for example, by increasing the number of H-bonding centers attached to the molecular constituents, from a single to several (e.g., triple, quadruple, even sextuple) units. In this project the cooperativity of associating networks will be tuned using the concentration of hydroxyl units as one of the many possible variables. Main goal: To analyze the interplay between the covalent and hydrogen bonds in homologous series of polymers networks blended with polymer-like associating liquids. Our approach: This project will extend our studies performed at University of Tennessee on the influence of H-bonding on segmental dynamics, glass transition, and rheological properties of hydroxyl terminated PDMS (HO-PDMS-OH) with different molecular weights (MWs). Broadband dielectric spectroscopy, calorimetry, and rheology were employed to characterize the relaxation behavior in these associating polymers. Our results revealed a very complex behavior, including strong change in segmental dynamics of PDMS induced by the chain-end hydrogen bonding, especially at low MW. 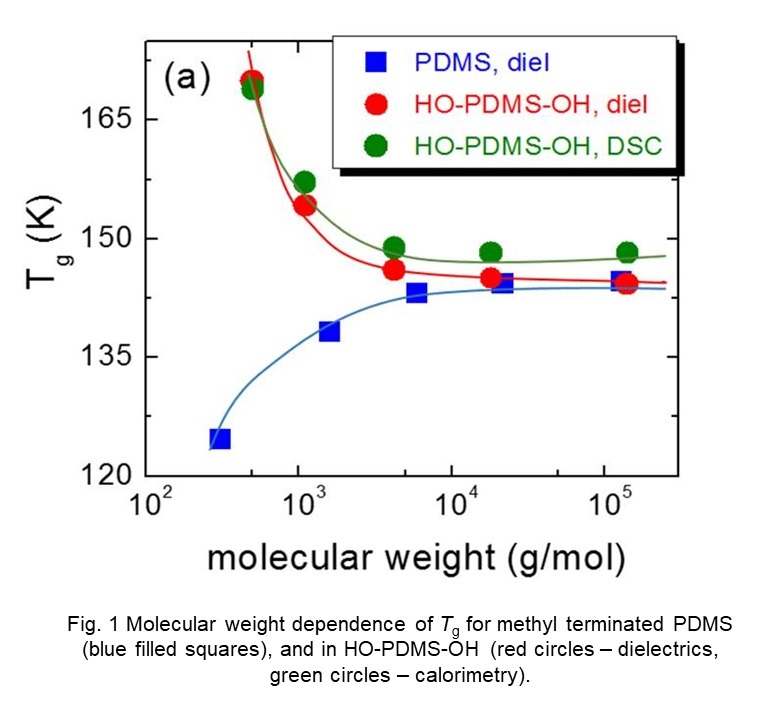 Moreover, dielectric and mechanical relaxation spectra revealed the appearance of a low frequency mode in hydroxyl terminated PDMS, which does not exist in H-terminated and methyl terminated PDMS. We demonstrated that this mode can be ascribed to the Debye process well known for low MW associating liquids. Another fascinating behavior is demonstrated in Fig. 1. As observed here, at intermediate and low MW the glass transition temperatures (implying the local mobility) is larger if the chains become connected via H-bonds instead of covalent bonds. In the present project one may additionally vary not only the MW of the polymer, but also its concentration at a given MW, its polarity, glass transition temperature, and its own ability of forming H-bonds. As a starting polymeric material we will use poly(propylene glycol) (PPG) with various chain lengths. We are in possession of this material with MWs progressively varying from the one of the monomer up to 18 000 g/mol, in the entanglement regime. As alcohol mixing partners we will choose 2-ethyl-1-hexanol and 4-methyl-3-heptanol, both commercially available. These are the model systems mono-alcohols associating in chain-like and ring-like structures, respectively. All systems are well miscible, do not crystallize, and are able to flow (even the entangled polymer) at room temperature, making the sample preparation easy. Dielectric spectroscopy will provide access to chain dynamics of the polymer (PPG exhibits an end-to-end dipole moment formed along it contour – is a type A polymer) and also to the Debye-relaxation of mono-alcohols, in addition to structural relaxations. The latter will also be traced in a broad dynamic range via nano-calorimetry. Rheology will be employed to monitor the evolution of both chain and segmental dynamics. Such a comprehensive experimental study will reveal important aspects regarding the self-association ability of small molecules and, most important for technological applications, regarding the recyclable, self-healing, and memory effects in associating polymers.